Wikimedia, CCPublicis Groupe chairman and CEO Maurice Levy. French advertising holding group Publicis Groupe has announced it is to acquire US-based digital marketing company Sapient in an all-cash transaction for $US25 per share, worth $US3.7 billion. Publicis says the acquisition will give the world’s third-largest agency group access to new geographical markets and the ability to create new revenue streams through digital consultancy, e-commerce and IT. It also means the group will achieve its target of deriving 50% of its revenues from digital three years ahead of its 2018 plan. The transaction will create a communications, marketing and technology group “agency of the future” with combined revenues in excess of €8 billion ($US9.9 billion) and combined EBIDTA of approximately €1.3 billion ($US1.6 billion), according to Publicis. The addition of Sapient’s 12,857 staff means Publicis will now have a workforce of more than 75,000 people worldwide. 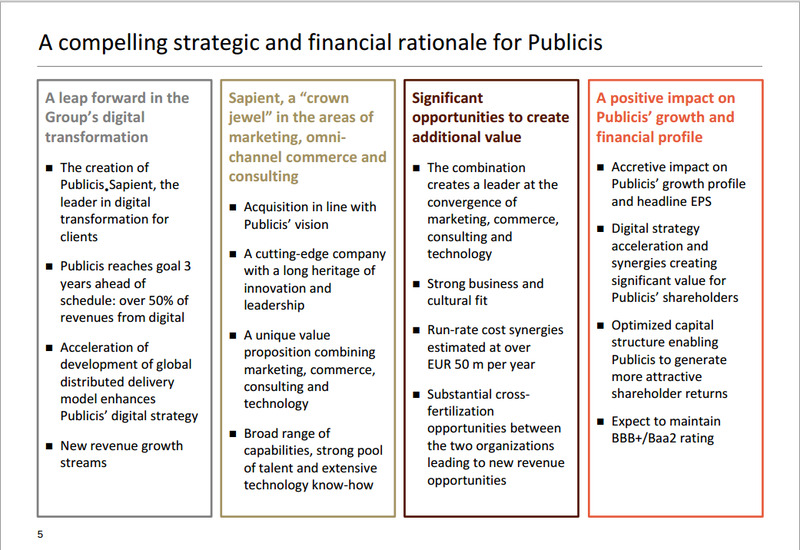 Publicis says the acquisition will deliver around €50 million ($US62 million) in cost savings over the next three years, through the integration of digital production, particularly taking advantage of Sapient’s production infrastructure in India, some real estate consolidation, G&A reductions and procurement savings. Sapient generated $US1.26 billion in revenue last year, up 12.3% in 2012. The company has delivered compound annual revenue growth of 15% from 2010 to 2013. The $US3.7 billion price Publicis is paying is a premium on Sapient’s current $US2.46 billion market valuation. Sapient’s clients include Coca-Cola, Target, Unilever and Audi. The purchase is Publicis’ latest effort to bolster its digital offering as consumers increasingly consume media across mobile and other internet channels. It comes five months after Publicis called off its attempt to form a merger with Omnicom Group, which would have created the world’s largest advertising group. Sapient’s share price last closed at $US17.32 and its stock has seen a sharp run up since late October, suggesting investors knew an acquisition could be approaching. 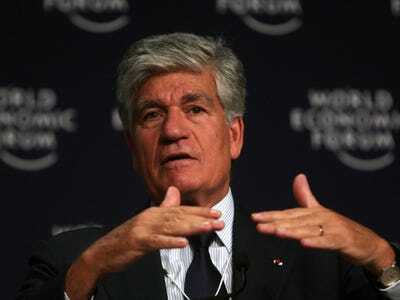 Publicis Groupe’s stock is currently up on its close last night of $US54.04. 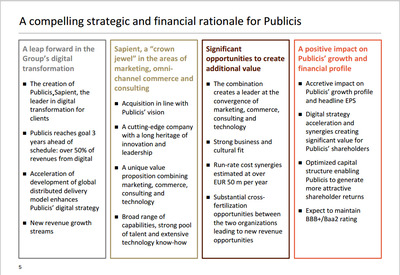 The acquisition will result in the creation of a platform to be named Publicis.Sapient, which the companies say in statement will create the “largest and most advanced” platform focused exclusively on digital transformation and “the dynamics of an always-on world across marketing, omni-channel commerce, consulting and technology.” Publicis.Sapient will also house other Publicis digital agencies including DigitasLBI, Razorfish Global and Rosetta. Publicis.Sapient will be led by Sapient CEO Alan Herrick. He first joined the Sapient in 1995 and became the company’s chief and a member of the board of directors in 2006. He was named co-chairman of the board in June 2012. 30 other senior Sapient executives will also enter into long-term employment agreements with Publicis. On the call Maurice Levy explained that the addition of Sapient leaves the company well-covered when it comes to digital marketing and advertising, but he did not rule out further, smaller acquisitions. The transaction has been approved unanimously by the management and supervisory boards of both companies. It is still subject to regulatory approval and is expected to close in the first quarter of 2015. News of the acquisition comes just a few days after the chief executive of rival advertising holding group WPP, Sir Martin Sorrell, said his company’s $US25 million stake in AppNexus left Publicis and Omnicom with “nowhere to go” when it comes to digital advertising. Sorrell responded to the news of the acquisition this morning by saying it looked like “the behaviour of a jilted lover,” referencing Publicis’ failed $US35 billion merger with Omnicom, which collapsed in May. Publicis Groupe reported organic/like-for-like revenue growth of just 1% to $US2.2 billion in its third quarter, which picked up slightly on the previous quarter but was not in line with analysts’ expectations. On the Q3 earnings call, Levy admitted the company’s disappointing performance was his fault for being “distracted” by the failed Omnicom merger.